How Safe are Lithium Ion Batteries? Are There Better Options Out There? How Safe are Lithium Ion Batteries? Are There Safer Alternatives? Because of lithium’s enormous capacity as an energy source, it has been the focus of much of the rechargeable battery industry’s time and attention. This effort has led to the development of the lithium ion battery which is rechargeable and more stable than its solid lithium counterparts, and used to charge our world’s most popular electronic devices. The popularity of the lithium-ion battery can be attributed to its high energy density, low self-discharge rate, quick re-charge time, and size. However, the lithium ion battery is inherently unstable, which means there is, and will always be a risk associated with its use. This raises the question: Is this a risk we need to take if we want the reward that comes from using our favorite devices or are there safer alternatives available? According to batterymart.com, the chemical difference between lithium and lithium ion batteries is that lithium batteries are composed of the actual lithium metal, whereas lithium ion batteries are made from lithium ion compounds. Lithium metal batteries have an historic reputation for instability. According to an article by Eric C. Evarts in the journal, Nature, at one point in the development of the lithium battery, its chemistry was designed in such a way that it released toxic gases, which built up inside the battery. When these gases came into contact with air, they ignited. This ignition resulted in dangerous fires and property damage. As technology progressed, however, developers discovered that lithium ion compounds are more stable—as long as they are properly sequestered from one another. These compounds, separated from one another within the battery, create a circuit charge. This difference accounts for the lithium ion battery’s increased stability and rechargeability. However, if for some reason the compounds come in contact with one another, big trouble ensues. How Safe are Rechargeable Lithium Ion Batteries? Lithium ion batteries have been a popular topic in the news lately because when lithium ion batteries fail, they can do so in a sensational fashion. Lithium ion batteries have the ability to burst into flames. And as batteries have gotten both smaller and more powerful, lithium-ion problems have been popping up more frequently. Just this month, Samsung was forced to recall 2.5 million phones when reports started piling up that the lithium ion batteries in the newly released Galaxy Note 7 were exploding. The Economist and CNET, among others, have reported on other companies, including Dell, Boeing and Tesla, who have felt the effects of lithium-ion-battery-induced meltdowns (otherwise known as thermal runaway) within the past 15 years. And we won’t soon forget about the hoverboard craze last Christmas, which ended with lithium ion batteries causing fires all across the United States. By July 2016, the Consumer Products Safety Commission announced a recall of over 500k hoverboards from 10 different companies. The batteries in these hoverboards were manufactured without oversight and illustrate the potential for damage inherent in lithium ion batteries not in compliance with industry quality standards. 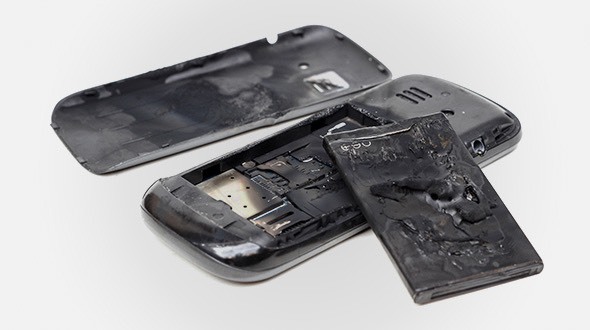 The unique safety issues with lithium ion and lithium-polymer batteries can be attributed to the materials being flammable and unstable at elevated temperatures. Flawed battery design, inadequate manufacturing quality, improper charging/discharging, and physical abuse can all cause these batteries to heat up rapidly by several hundred degrees resulting in explosion and flames. When manufacturing quality standards are met, lithium ion batteries have multiple safety features to protect lithium rechargeable batteries from overheating during normal operation. These features, coupled with best design and manufacturing practices, are adequate for most consumer devices. In fact, there’s a good chance you are reading this article on a device powered by a lithium ion battery, because they are the primary choice of battery power for cell phones, computers, tablets and smaller devices such as e-cigarettes. However, as devices get smaller, miniaturization presents a big technical challenge for lithium ion batteries. Battery manufacturers must leave room within the battery to make electrical connections and allow for electrode expansion during operation—both of which decrease its potential energy content. It’s a classic trade-off between performance and safety with decisions varying greatly from one manufacturer and product to the next. Another serious risk, which hasn’t received the same amount of attention in the news as fires and explosions, is the risk of ingestion. Lithium ion batteries are very dangerous and even life-threatening if accidentally swallowed. Death and injury of children swallowing coin and button cell batteries occurs all too frequently today and this has attracted the attention of groups such as the Consumer Product Safety Commission and the World Health Organization. This has prompted the industry to develop standards to help reduce battery ingestion. See http://www.poison.org/battery/stats for button battery ingestion statistics. Are there Safer Microbattery Options Available? The origins of silver-zinc battery technology are decades old. Silver-zinc batteries were used by NASA and the military for mission-critical applications since the 1950s. However, these early batteries were only able to take advantage of the compound’s high energy density and weren’t commercially viable because of the limited number of recharges each battery could accept. Through nearly two decades of research ZPower has solved the rechargeability problem of silver-zinc. They developed a silver-zinc rechargeable microbattery that can be fully recharged over 400 times without losing significant energy capacity. Where silver-zinc technology offers very distinct advantages over other rechargeable battery technology is in the microbattery segment. Silver-zinc microbatteries offer greater energy density than equivalently sized lithium ion batteries, and as far as safety goes, there is no comparison. ZPower batteries use a water-based chemistry that’s stable, non-flammable, and non-toxic so there is no need to worry about a device exploding or death due to ingestion. Also the batteries are fully recyclable and mercury free which makes them better for the planet too. The silver-zinc battery is just one of many examples of today’s battery evolution, and hints at what battery technology for many small electronic devices can be like in the future.